This delicious vegetarian spaghetti sauce recipe will have your friends and family raving about how long you must have spent in the kitchen. 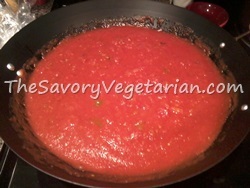 It's made using blended up canned tomatoes, chunky onions and bell peppers. Just add in a bit a few dried spices and you've got yourself a thick, hearty homemade sauce that's both delicious and filling. Serve it up over your favorite spaghetti noodles with a slice of garlic toast and your family will thank you. Aaron loves when I make spaghetti with this recipe. It's thick and chunky, a little bit sweet and ever so delicious. The longer you simmer it, the better it tastes. Wash and chop your onions and green bell peppers. We like ours chunky, but you can dice them as fine as you like. It is your masterpiece afterall, and it should appeal to your taste buds and your family. Throw them into a large skillet with a bit of cooking oil and saute until the onions and peppers are tender and slightly seared. Add the minced garlic and cook for about a minute. Blend up both cans of tomatoes in a blender. 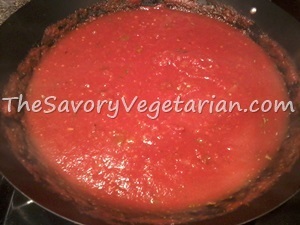 Add tomatoes to the skillet and reduce heat. Add sugar, oregano and basil and simmer for 35-40 minutes. Serve over your favorite spaghetti noodles with a slice of garlic toast or a steamed veggie side dish. Absolutely delish. Don't be shy about giving it a quick taste test to see if you need to add anything else. Your the best judge of what you like, so if there is something you think it's missing, by all means, add it. Experimenting in the kitchen is how you find out what works for you and your family. Always add extra ingredients 1 at a time, and let it cook into the sauce a bit before trying it again. Adding too much of anything can ruin a completely good sauce, so be careful... especially when adding something that has a strong flavor.